While they did not quite make it into my top three, there were several other biscuits that are definitely worth mentioning. 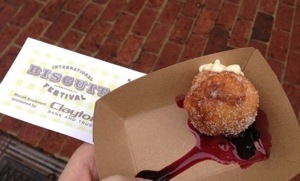 The Biscuit Love truck totally rocked the sweet category with their Bonuts. Yep. That’s a biscuit donut combo. It was filled with cream and served with some kind of berry compote. Folks were talking about this one. Biscuit Love Truck is from Nashville, too. Nice to see my hometown represented. 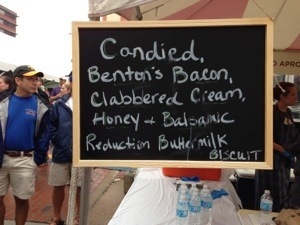 This biscuit with bacon, clabbered cream, and a balsamic reduction drizzle was the most “gourmet” of the bunch I tried. Sometimes that kind of thing feels forced and sounds better than it really is. Not so in this case. I had to Google clabbered cream. It is basically a sour cream but better. 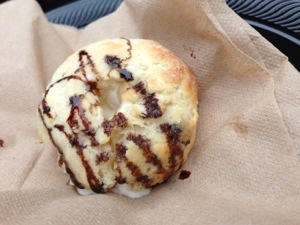 It was piped into the hot biscuit right before serving and then the balsamic was drizzled on top. It was slightly sweet and the flavors all melded well. It is so pretty, too! Southern Living is another I have to mention. 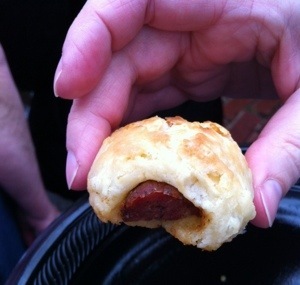 They made a kind of “pigs in blankets” biscuit that was crusty and buttery on the outside, soft on the inside, with the perfect proportion of sausage to biscuit. I read later that they went through all 1000 biscuits they had brought in two hours! See my next post for tips on getting the most out of your festival-going experience so that you don’t miss out when you go next year. 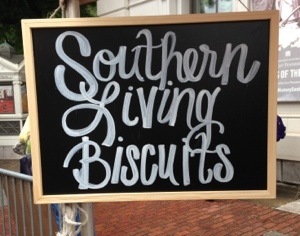 This entry was posted in Activities and tagged biscuits, festival. Bookmark the permalink.